Did I just miss you talking about and showing us the other two water queens you summoned? If not, can you show them? Edit:maybe a side by side and a brief discussion of what makes them each awesome in their own way? I know you're the star of the thread and all but would it kill you to do more than just skim my posts? I work really hard on them! 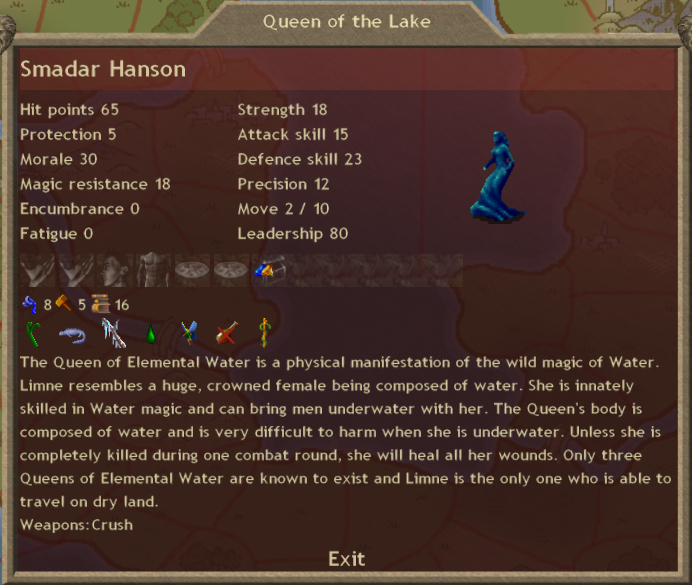 All three of the Elemental Queens of Water have regeneration (in varying amounts), recuperation, cold resistance, and poison resistance. Thalassa can summon undines which are small and tough but aquatic only, Bathsuma can summon Water Elementals which are big and powerful and amphibious, and Linne cannot summon anything but she is amphibious. Like all elemental royalty they are magic beings who need not eat and they have all item slots except boots. #1: Turn 55 was Thalassa, Queen of the Sea. 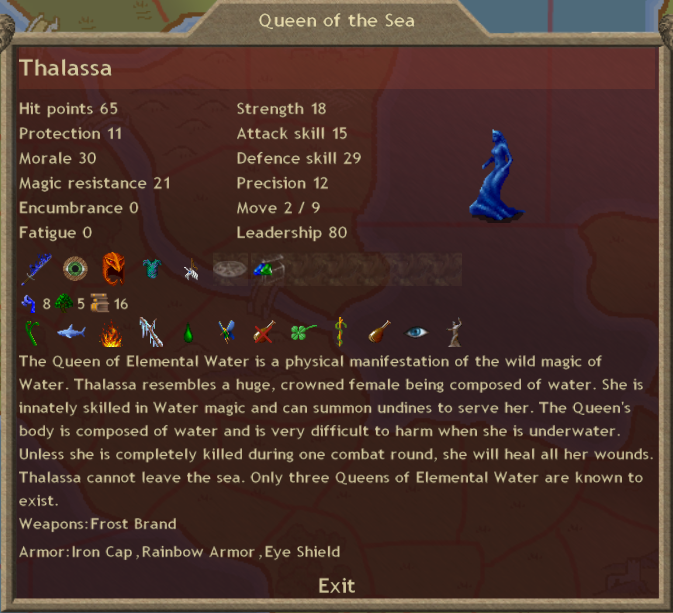 Thalassa is W8N5 and generates 1 each of a Water and Nature gem each turn. She can forge Clams of Pearls or summon Naiads who can themselves forge Clams. She can forge the Treelord's Staff to boost herself or other Nature mages. She can cast Living Castle to build underwater forts in key locations. She can cast Faerie court to break into Air (or forge Rainbow Armor), as long as she has an Amulet of the Fish. With one booster she can summon Tarrasques and therefore break into any damn thing. She can set up a "C'tissian Special" all by herself (Serpent's Blessing, Quagmire, and Foul Vapors) although the point of that particular setup is to be able to unload all three of those spells in the first round. She can cast Charm, although without boosters and penetration items that spell fails rather other. Still, her default abilities and paths allow her to do things like add Personal Regeneration to an already powerful lineup of melee-friendly self buffs and Living Water. 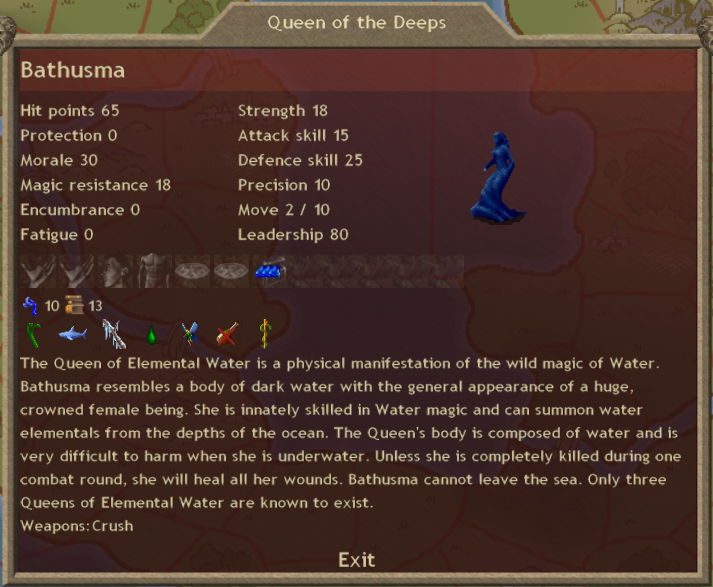 #2: Turn 61 was Bathsuma, Queen of the Deeps. Bathsuma produces 3 Water gems each month and can cast any water spell. Spells that scale with paths are ridiculously potent when she casts them (although the 8W of the other two queens is pretty incredible as it is). She makes up for her lack of diversity with extremely high regeneration (I think it's 85% or something, off the top of my head) the most free gems each turn, and the better summon. Water Elementals are beefy and amphibious. In case you were wondering, she is a good candidate for empowering Fire if for no other reason than that her Acid Rain coverage would be phenomenal. #3: Turn 63 was Linne, Queen of the Lake. Finally there's Linne. She has no summons and the weakest base regeneration (I think it's 60%) but she is the only Elemental Queen who is truly amphibious. She gets 1 Water and 1 Earth gem each turn, and she can break into Earth magic with Troll King's Court or Elemental Kings of Earth. She can cast Earth Attack or cast any number of great battlefield buffs, starting with the reinvigoration-providing Summon Earth Power and continuing up through all of the good earth buffs like Army of Lead/Gold or Weapons of Sharpness. She can cast things like Earthquake or Blade Wind, she can summon Iron Dragons and Cyclopes and Grendelkin and an ungodly number of Claymen. Seriously claymen are not that terrible, especially when you get 11 for only 5 water gems. I am past being out of time for posting today, but I hope that was helpful!